The mixology geniuses behind Experimental Cocktail Club in Paris are helping transform the Spanish island of Ibiza into a compelling food-and-drink destination. 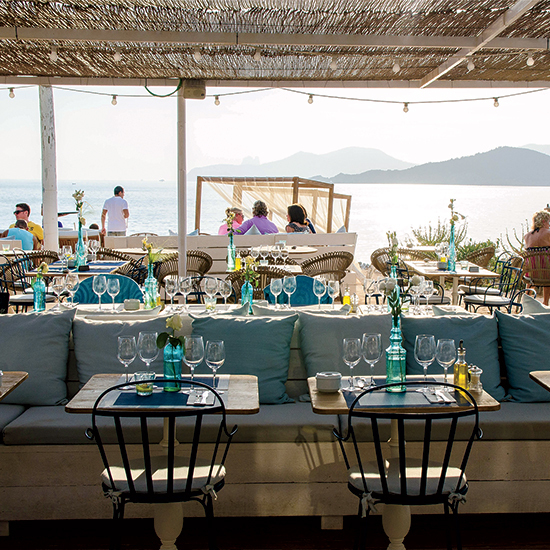 Two things you couldn’t do until recently on Ibiza: eat or drink very well. “Even at the best places, there was a tendency to put a big Buddha at the entrance and serve sushi and pasta on white Plexiglas tables,” de Goriainoff says. Now that’s changing. The extraordinary chefs Ferran and Albert Adrià are the latest to open a place there. Meanwhile, de Goriainoff has launched his Ibiza bar and restaurant with partners Olivier Bon, Pierre-Charles Cros and Xavier Padovani. At most chiringuitos, the design is very simple and the specialty of the house is a sandwich and an Estrella beer. The Experimental Group wanted something modern but still true to a chiringuito’s casual beach vibe, so they brought in the French designer Dorothée Meilichzon. She transformed a small fishing boat into a bohemian bar and outfitted the restaurant with rattan, natural wood and sky-blue cotton. Chef Alex Larrea serves simple Mediterranean dishes like tender pan-grilled octopus with local chorizo. As for the cocktails, the group eschews the avant-garde ones they’re known for, instead preparing whimsical takes on the classics, like a mai tai mixed with a hit of whiskey so it’s not too sweet. The signature drink is the Pineapple Express, spiked with rum and served in a frozen pineapple with a pair of straws. It has a splash of grenadine, which gives it a pretty pink color that looks a lot like an Ibiza sunset. It’s an image that continues to inspire de Goriainoff. “I’d love to open up a hotel in Ibiza,” he says. Las Salinas; eccbeach.com. Gisela Williams is Food & Wine’s European correspondent. She lives in Berlin with her family.